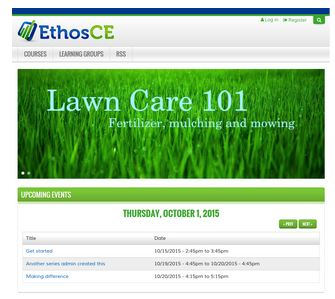 Webinar: New EthosCE LMS Product Features Released! After many months of work, we are excited to announce the release of EthosCE 7.4.3, the latest update to our learning management system designed for continuing education. EthosCE 7.4.3 provides new features as well as incremental improvements to existing features. This release is available to be scheduled for new and existing customers beginning December 2015. Support for GoToWebinar is now native to EthosCE! All customers with a GoToWebinar account are now able to create webinars, automatically enroll learners, and evaluate the amount of time spent in the webinar as a requirement for completion of the course. Administrators may send an email to an individual on the waitlist or to the entire list to announce newly available spaces or the availability of another course. EthosCE has long supported Webforms, a powerful tool for collecting information from learners in a course or the public at large. However, for EthosCE customers with many administrators, keeping track of which webform to use as a “template” has been a challenge. Templates could accidentally be edited or used in the wrong place. With EthosCE 7.4.3, Webform templates allow for a locked, permission-restricted template that can be easily copied into a new template when creating a course object. EthosCE’s powerful credit awarding module provides robust features for credit eligibility, certificate mapping, credit types and credit claiming, and now it extends those features for administrators to use on an ad hoc basis. 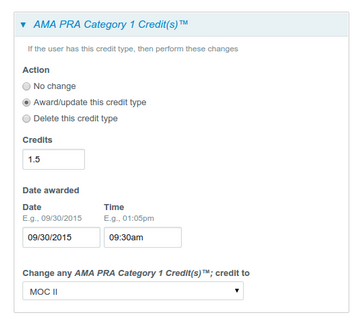 Administrators can now visit any course report and award any type and amount of credit to any learner, either individually or in bulk. Learners who have already earned credit can have their credit type or amount changed. Administrators can also delete credit. This feature also comes with audit capabilities so that any awarded credit can be traced back to who awarded or edited it. Deleted credits are also logged in a deleted credit log. Users with the report viewer role may log in and view any system report. The report viewer role does not have any course or site editing permissions. This new role allows you to grant access to reports without being concerned about unwanted access to administrative functionality. All question types can now be imported via a CSV file. Imported questions can be added to a quiz and if necessary, updated be reimporting. We have introduced a new homepage block that consists of a full-width, all-image promo. This allows the site admin to have full control of typographic design and layout within the block. The block also supports a series of all-image promos that are displayed as part of a slideshow and can be linked to a course or other page. RESTful XML/JSON Web Service – A RESTful web service is now available as an add-on module. Web service functions include retrieving and creating users, retrieving course enrollments and completions, and e-commerce. Web service documentation is available online. The transcript importer now gives administrators the option to enroll existing users immediately or to enroll them upon login. Enrollment records for nonexistent users are saved and awarded when the learner creates an account. Course objects before 7.4.3 provided conditional access based on a single grade, for example, higher than 70%. In 7.4.3, administrators can now specify a range that allows access. This allows for remediation course objects. For example, if a learner scores between 0% and 69% a course object can be presented to them but not learners who scored 70% or higher. In addition to conditionally allowing access to course objects, administrators can now make an object optional based on a grade range. In this way administrators can allow a learner to “test out” of a required course object by showing mastery of a subject in quiz and scoring higher than a specified percentage. We’ve added additional options to the quiz feedback settings. 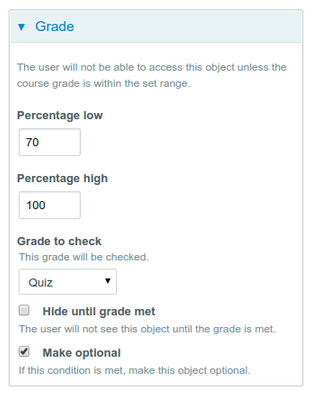 Administrators can now restrict feedback to only be shown after the learner passes the quiz or exhausts their attempts. The following reports are new! Quiz Download Report: A download of all users’ responses to all quiz questions including full user profile data. Course content usage report: A system-wide list of all course objects and the courses that contain them. Reported Credit Failure Report: This report shows all credits records that were not accepted by a third-party, such as an AMS, CRM, or credentialing organizations such as CPE Monitor. Deleted Credit Log: A log of all credit records deleted by administrators. Course Credit Log: A log of all credit records for a learner including a history of administrative edits. The site administrator can now set the start date of the 365 day range to be used by PARS reports. The Webform module has been updated and includes several new features including the ability to allow conditionals to act on more than one component in the same rule. This great feature allows for complex conditional to be created more quickly. Grid questions have also been improved to include support for semantic differential survey questions. This is a grid with opposite values on the left and right of the scale. Course and Site Administrator roles may now configure content to be excluded from search on a per-content item basis. For example, a single course or webform can be excluded from search. The EthosCE calendar has been updated to improve display on smaller screens. Role based pricing can now be configured to display all roles and the associated price, or only the price that the user is eligible to receive. 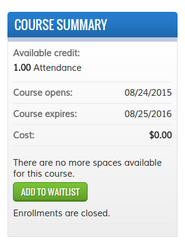 In addition, either $0.00 or no price can be displayed for free courses. Quiz now numbers all quiz questions. When referencing a course or content object, administrators can either continue to enter the name or use the node ID. This is useful when EthosCE contains many courses or objects with similar titles. Administrators may set a custom subject line per reminder.